When Hanuman returned home Ram was so pleased that he hugged him like a brother. He had found Sita. the was one little problem. How would the monkey army cross the sea? They decided to build a bridge that would reach the shores of Lanka. Monkeys of all sizes scrambled to collect branches, stones and large boulders and dragged them to the shore and piled them one on top of the other in the sea. In five days the bridge was finished. Ram, Laxman, and Sugreeva led the monkey army across the bridge to Lanka. Ravan's army was waiting for them. It was an army made from terrible demons. Ravan decided that it was time for him to join the fight. All his brave generals and warriors had been defeated. Ravan put on his armour. Wearing dazzling armour made of solid gold and precious jewels, Ravan mounted his chariot drawn by four magnificent black horses. 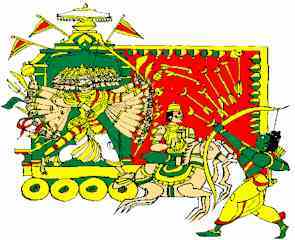 With his ten heads and countless arms Ravan attacked. The monkey folk attacked the terrible demon, but their stones and boulders rolled off his body like water off a ducks back. 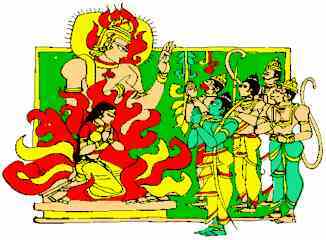 Laxman rushed forward to help his monkey friends, but Ravan wounded him with a powerful thunderbolt. The monkeys told Ram that they knew of some herbs that could save Laxmans life. Hanuman to the rescue. He was swift as the wind and flew up into the air and disappeared in the direction of the Himalaya Mountains. When Hanuman landed on the mountain, he found a million different kinds of herbs. He had no idea which were the right ones that would save Laxmans life. 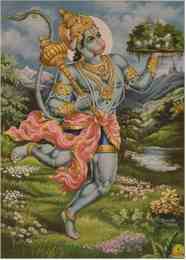 Hanuman knew that the only thing he could do was to pick up the whole mountain and take it back to Laxman. Hanuman returned to Lanka with the mountain in the palm of his hand, the monkey folk made a medicine out of the herbs gave it to Laxman. It worked like magic and Laxman was made better. Ram decided that it was time that he took on the terrible Ravan in battle. Ravans twenty arms swung their weapons all at the same time! Every time Ram managed to cut off one of Ravans heads, another one would grow in its place. The monster seemed indestructible. Finally, Ram hurled his weapon with all his might at Ravan. A deafening roar was heard as the the mighty Ravan was destroyed. Ram sent Hanuman to Sita to tell her the good news. Sita turned to Laxman and told him to build a fire. She told Ram, that to prove her love she would walk through the fire that Laxman built, and if she was not loving then the flames would burn her. Sita calmly walked into the flames. The crowd gasped with horror as the flames wrapped around Sita. But a few moments later the people gave a sigh of relief as Sita walked out of the flames, not a hair on her head was harmed. 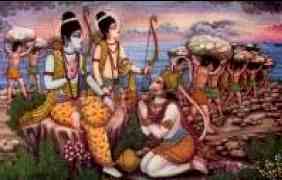 Finally the fourteen long years were over and Ram, Sita and Laxman were ready to return to Ayodhya. Bharat was overjoyed when he heard the news. 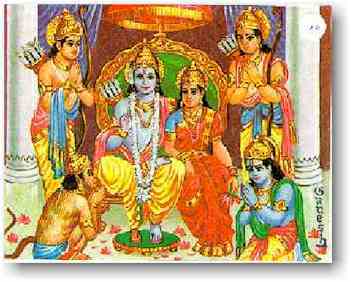 When Rama, Sita and Laxman entered the gates of Ayodhya, a cheer went up from the crowds. The brothers were so pleased to see each other again. Ram gave Sita with a beautiful pearl necklace . At last Rams coronation was complete. The gods smiled down on the new king of Ayodhya. From then on prosperity and happiness reigned in the land.